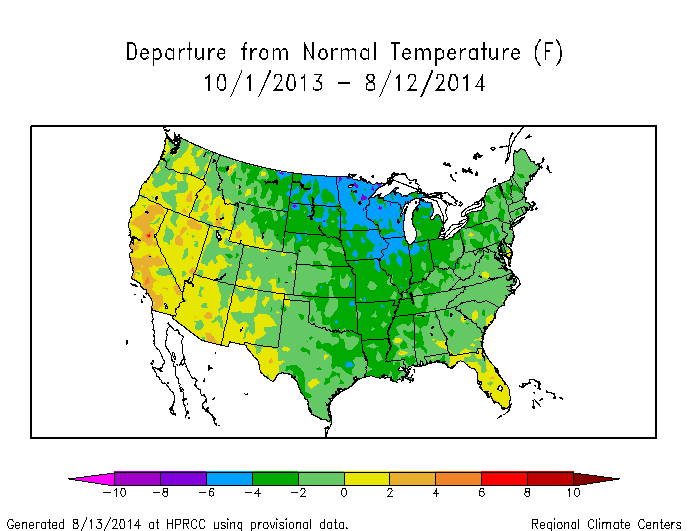 Temperatures have been below normal in 75% the US since October 1, 2013, with the average departure being -1.29 degrees. But it is worse than it seems. Most of the 25% percent above normal has been barely above normal, while the 75% below normal has been generally much below normal. The next graph shows percentage area weighted by the deviation. It isn’t warming up, either. 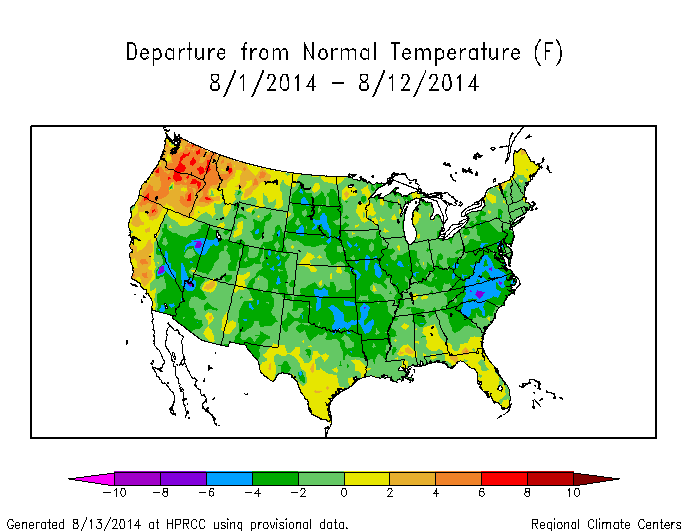 75% of the US has also been below normal temperature this month. But it is still the warmest month on record, – after adjustments. the NCDC will take care of that with a few key strokes. it does not fit the narrative so must be dealt with. That’s because all the ‘greenhouse gas’ are stuck in the greenhouse. I wonder if SG has any comments on this. Did the weather support this sudden change which seems to account for at lease 3 days all of a sudden? I predicted this would happen a few days ago. There is going to be a sharp drop in extent over the next week, due to a large high pressure system which will compact the ice in the western Arctic and the East Siberian Sea. Ugh, do you understand the difference between Sea Ice “Extent” and actual melting?? When wind kicks in it pushes and compacts the ice .. lowering its “extent” … that’s different than melting. I attribute this situation to low solar activity from a very weak solar cycle #24, following a deep minimum. Further declines in solar activity are expected as SC24 winds down into the next minimum, in about 5-6 years, ~2020, and if SC25 follows suit ala Penn & Livingston, we’re in for a long cold slog for possibly decades. Same message is coming in from many others around the world. We used 40% more wood during the winter of 2013/14 than each of the past six years, and this summer our garden is quite sad here on the 45th parallel in Michigan. Cool 60’s now. That is alright Bob, The EPA has a solution…. They are now banning wood stoves. …. The EPA has recently banned the production and sale of 80% of America’s current wood-burning stoves,…. The impacts of the EPA ruling will affect many families. According to the U.S. Census Bureau’s 2011 survey statistics, 2.4 million American housing units (12% of all homes) burned wood as their primary heating fuel, compared with 7% that depended upon fuel oil. If they pull what they did in Taxachsetts, every time a house is sold it must meet CURRENT standards and be inspected. At the time we left they had an idiotic law that all septic systems had to be 10 ft above water level. We managed an inspection during a drought and got the heck out. LA went one better, they sent inspector around Antelope Valley and tossed everyone out of their homes and made them dismantle the house to boot. Antelope valley is now home of Warren Buffets Solar farm SURPRISE! Time for the Militias to get serious. Seems to me it’s about time for you to make use of the advantages conferred upon you by the Second Amendment, Cousins. Why do I get the feeling that it will take an entire year of Great Lakes ice to finally put these cockroaches in the light? Even then it could be sketchy; the lies can turn on a dime. Maybe a glacier crossing the US-Canada border can do it? August 14th and Fall has already set in up here in New York. The aspens are turning here in Colorado.. a month early.. too much rain they say. So much for the epic drought caused by global warming. That was just last year.